This weekend I caught most of an episode of Silver Spoons that centered on baseball cards. I don’t make a habit of watching episodes of Silver Spoons, but for reasons I am no longer in contact with I watched plenty of episodes of the show when it first came out back in the early 1980s. I was a teenager by then and should have had better things to do than watch a “heartwarming” sitcom about a little rich kid and his “zany” father (the theme song alone should have caused me to sprint screaming into the night), but I guess I didn’t. What was I supposed to do, push-ups? Homework? My evenings then, as now, as ever: television. Hence, at an age when in another time and place adolescent Indian braves of yore were traipsing through the wilderness purified by fasting and prayers in search of life-defining visions, I was watching Silver Spoons. However, possibly because underage drinking and other mind-altering substances swooped in to spirit me slightly away from television for a while, I missed the episode a few seasons into the show’s five-year run that featured Ricky (Ricky Schroeder) and his grandfather (Academy Award-winner John Houseman a couple roles away from The Final Curtain) scheming to make a killing with baseball cards. The mention of baseball cards is what stopped me on my tour through the channels. Though the scheme the robber baron grandfather hatched was pretty ludicrous (noticing that his grandson has cornered the market on Tommy Lasorda cards, he drives up the value of the cards by starting a rumor that Tommy Lasorda is about to be voted into the Hall of Fame), it’s interesting to me that the episode aired when the baseball card industry was reaching its peak, and the skyrocketing value of cards was making kids into savvy, merciless businessmen. I had stopped collecting cards by then, so I missed out on being inside the bubble of card prices that seemed for a while as if it would expand forever. It must have been exciting, but I think it would have made baseball card collecting a little nerve-wracking for me. With my cards, I wanted to dissolve away from the world and enter another world. If I was constantly worried about whether to “invest” in, say, Pat Listach or Gregg Jefferies, I think I might not have enjoyed it as much, or found as much comfort in it, because I’d still be present, capable of losing, instead of disappearing altogether into the world of the cards. 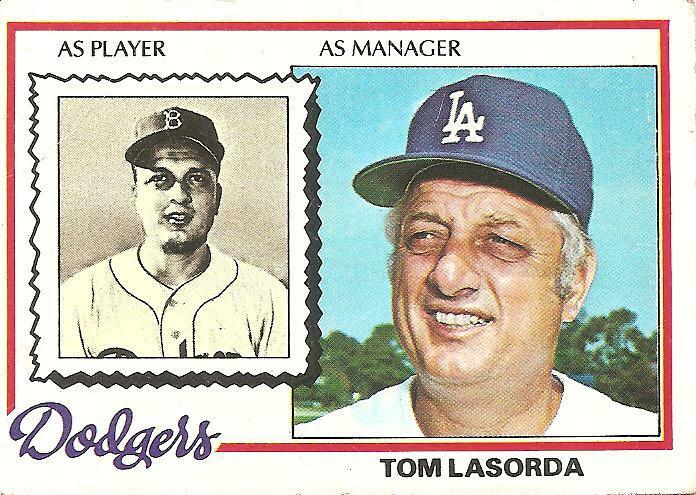 This Tommy Lasorda card at the top of the page was from the group of manager cards in the 1978 set. I liked these cards for the long listing of mostly underwhelming minor league stats that is on the back of almost all of them. Lasorda is no exception, toiling for many years in the minors with only enough cups of coffee in the majors to compile an 0 and 4 record with a 6.52 ERA. He did have some big years in the minors, though, mostly with the Dodgers’ affiliate in Montreal, for whom he played for eight seasons. He seems to have been an overachiever as a minor league lifer: He didn’t strike many guys out, and he walked guys a lot, and somehow he usually won more games than he lost. I wonder if he started to get bitter that The Call never really came. It seems particularly cruel that he was shipped to the Dodgers’ minor league affiliate in Los Angeles in 1957 (where he was a teammate of both legendary minor league slugger Steve Bilko and fellow future manager Sparky Anderson), and then when the Dodgers themselves came to Los Angeles the following year they sent Lasorda back across the continent to Montreal. I imagine him on a mound in Montreal in early April, freezing his nuts off, using some colorful language as he dwells on Dodger golden boy Sandy Koufax, who in an earlier season took Lasorda’s place on the major league roster. At the end of the Silver Spoons episode, Tommy Lasorda makes an appearance. He has a whole bunch of cards of himself, which will “flood the market” and drive prices back down and make official the restoration of innocence that Ricky already started moving toward when he gave back the money he’d fleeced from his friend. I believe the last line of the episode is Lasorda’s, saying something like, “Hey, did you hear? I’m a shoo-in for the Hall of Fame!” He actually did make the Hall, but it was twelve years after the episode aired. I don’t think he thanked John Houseman in his acceptance speech for getting the ball rolling. I also have to think he refrained from the colorful language that, in this day and age of the ever-present recording device, has given Tommy Lasorda two lives, one being the sunny, wholesome Dodger Great shown on the front of the 1978 card at the top of this page (and in the 1985 episode of Silver Spoons), the other being an incredibly foul-mouthed accidental entertainer of the YouTube generation. I have to admit that the latter is by far my more favorite of his two incarnations, in part because he is clearly one of those people blessed with the ability to use obscenities with operatic gravitas and gusto, and also because the latter Tommy Lasorda persona seems to be the one connected with its vitriol and bitterness and also its vivid life and its unadorned humor to that more interesting personal life story, the one present on the back of his 1978 card, the life of the marginal itinerant far from sunshine and Cooperstown. You are currently browsing the archives for the Tom Lasorda category.